I'm glad I read Eliot Schrefer's other novels before getting to The School for Dangerous Girls. I already knew he was a talented writer who could tell a story full of twists. With the Ape Quartet, Schrefer found his ideal genre and subjects. While his writing skills are still evident in this early novel, it's missing the spark of his other work, as well as his ease with crafting a plot. Angela has been sent to Hidden Oaks, a last chance school for girls before they end up in prison or on the streets. 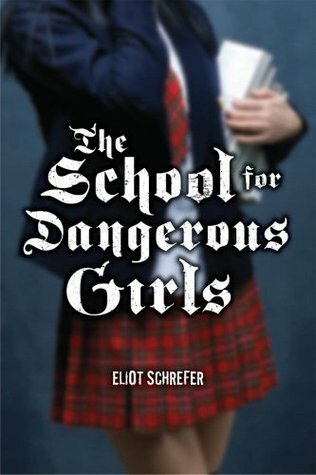 She has to keep her guard up around the other dangerous girls and sadistic teachers, which she thought was the worst of her problems. The more she learns about her new school, the more trouble she realizes that she is in. I stayed up late to finish the book, which says something good about it, but there was so much suspension of disbelief required. I won't be recommending this book to my students. Instead, I'll hand them something from the Ape Quartet and let them see Schrefer at the top of his game. So much of my reading these days involves parenting books, so I figured I'd jot some notes about them here so I can refer back. 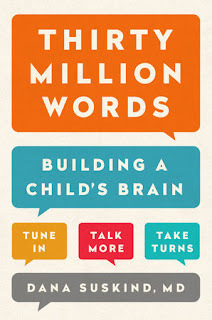 It's interesting how many parenting books rehash what is taught in the first few weeks of teachers college. I've found that most books have an original nugget and then are padded out with tons of the same child development information. What about parents who already know about the zone of proximal development and Carol Dweck's mindset theory? Lots of skimming to find the heart of the book. 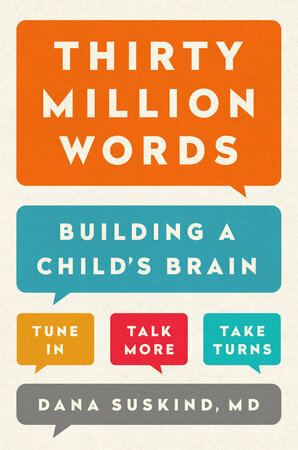 In this case, it's all about meeting your child on their level, talking with them, and truly interacting. Yup, got it. The nugget I'm taking from Thirty Million Words is to try to use the word "it" less frequently and use the actual noun instead, to reinforce the word. It's harder than it sounds! Glad I learned that, but didn't need 300 pages to get there. WOW--NINE YEARS OF DEVOUR BOOKS! Happy Birthday to this little memory device. Another review in GIF form because I'm a bit conflicted by What If It's Us. I really like author Becky Albertalli and had never read Adam Silvera before, so had high hopes. I usually enjoy novels that trade off between authors and characters, but this one didn't quite hit it for me. At first, I had a really hard time distinguishing between the two characters, Ben and Arthur. Although they were very different, I had to keep up with who was in summer school and who was doing an internship, as well as the various friends in their squads. It took a minute. I realize that everyone has their faults and issues, but this book seemed to really highlight all of the character flaws. 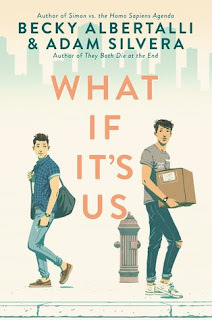 The only characters I found extremely likable were Dylan (one of the best friends-would have to open the book to figure out whose) and his girlfriend Samantha. They were funny and thoughtful and really. Not so much angst. Am I happy that there are YA romance novels about gay teens? Will I be recommending this to my students? It was too long, the characters irked, and the ending was unsatisfying. I was in my 30s and living in another country when my grandmother got Alzheimer's disease, but it was still awful to see the vague confusion on her face when she tried to figure out what was happening. 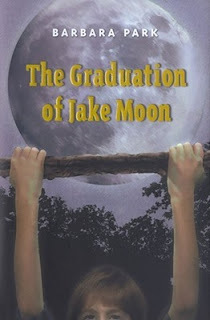 This experience stuck in my mind as I read The Graduation of Jake Moon, about an eighth grader whose grandfather is slipping away to the disease. During middle school, the last thing anyone wants is extra attention, so the embarrassing incidents that come along with the disease are devastating to Jake. He withdraws from his friends and his school so that nobody can make fun of him. But such a serious disease can only be hidden away for so long. I ended this novel in tears because there really aren't many happy endings with Alzheimer's. Still, I feel like Jake grew as a character throughout the novel and the reader will, too. This slim volume will appeal to readers who like "issue" books, but is also perfect to hand to a student who may be in a similar situation. What a journey with this one! I never imaged when I was on page 100 of Orphaned and the plot was dragging that I would be in tears as it finished. I should have had more faith in Eliot Schrefer and that he would finish his Ape Quartet powerfully. Still, I hope young readers will have the patience to get into the meat of the story where really beautiful writing happens. Schrefer goes for a bold challenge with this book: it is written in verse and from the perspective of a gorilla named Snub. While it makes sense that a gorilla's point of view would look very different from a human's, I found it frustrating at first to understand what was going on. And I love novels in verse! I had so many questions until I decided to let go of them and let the story unfold. When I did, I grew to appreciate the characters and story, and ended up in tears. I'll be encouraging readers to persevere and finish this book because it is worth it in the end. There's a huge buzz around Jarrett J. Krosoczka's graphic memoir, Hey, Kiddo. All of the praise is well-deserved. Krosozka delves into his family history and shares about his mother's heroin addiction, his loving but troubled grandparents, and his absent father. While his mother popped in and out of his life (and jail), Jarrett grew in his artistic talent. By including many of his childhood drawings and museum clippings, Krosoczka shows young readers that cartoonists aren't born full formed; they develop their skills and take classes to improve. The emphasis on hard work is clear and I hope it is a takeaway for all readers. 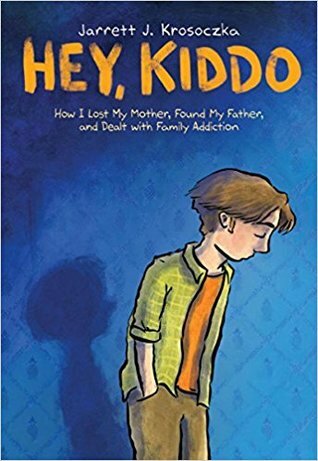 This is a story that will speak to so many young readers, so it surprised me that there were only 5 copies in the Worcester area library system. This is where it is set and where the author's lie was shaped! I am going to encourage my local branch to get their own copy because it is another way for readers to see themselves in print, and because it is a book that deserves to be read. 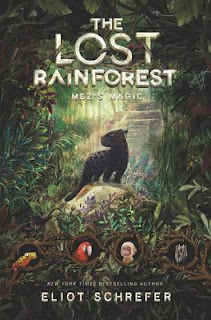 As I've mentioned before, I don't like animal books, but Eliot Schrefer is the exception! As I make my way through his oeuvre, I find myself continually looking forward to what comes next. Mez is an abnormal panther: while most of her kind sleep all night to avoid the Daywalkers, she is able to stay awake and explore at all hours. She is recruited to join a group of animals like herself, all with the goal of defeating the evil Ant Queen. But there are many challenges along the way and it is difficult to know who to trust. I liked that Mez's Magic was educational. I don't know much about jungle animals and found myself learning about them in my favorite way, through fiction. While the secondary characters all had a prominent trait to identify them (Rumi is knowledgeable! Gogi is self-conscious! Lima talks too much! ), Mez is relatable in a way that occasionally makes the reader forget she's a panther. I loved the ending of the book and how it sets up the sequel, which will be published in a month. I'm looking forward to finding out what happens next. I've been working my way through Eliot Schrefer's Ape Quartet and was surprised to learn that Rescued was set primarily in the United States. I think it was clever to bring the story closer to home for many of his readers, with the intent of creating a relatable character and sympathy for the plight of orangutans. Unfortunately, this novel didn't work for me as well as the first two. When he was a child, John's father brought him home Raja, an orangutan from Indonesia. Rash decisions are typical for John's father, who continues to spiral downward throughout the novel, leaving John and his mother to deal with the consequences. The biggest of which is a rapidly growing ape who needs more care than anyone can provide. When John takes it upon himself to do right by Raja, he realizes what a challenge that actually is. There were some things I enjoyed about Rescued. 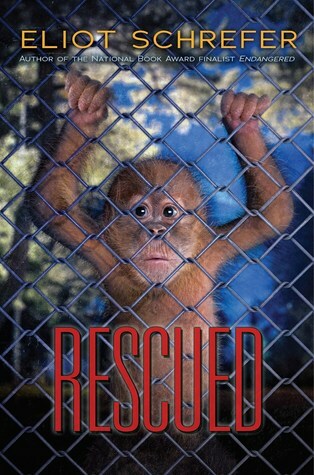 I like that this novel talks about animal testing and how many of those animals end up in labs. I also appreciate that Schrefer quickly dispels the idea that it would be fun to have a pet ape (in ways both violent and disgusting). I wanted to like it more, but I found this novel to be very dark and the main character to be inherently unlikable. Perhaps it was a deliberate choice; John's father didn't set him up for success, but I couldn't connect to him the way I did with the author's previous protagonists. 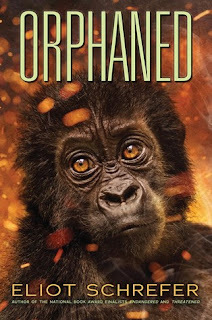 Still, I will continue reading the series and am curious to see what Schrefer does with his next main character, an actual ape instead of just a person relating to one. 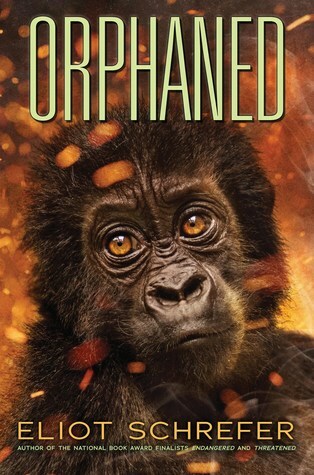 I love the idea of this series by Eliot Schrefer: each novel centers around a human's interactions with a great ape. 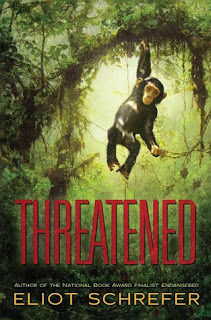 Threatened focuses on chimpanzees, who are far more brutal than the bonobos of Endangered, but I still found myself worrying about them, thanks to their relationship with Luc, our hero. I'm going to do a GIF review because those are more fun for me right now, and because I am packing up to move to a new country where Elio Schrefer will be the visiting author in my class. So thrilled to learn from him. Did I like it as much as Endangered? Will I recommend it to students? True confession: I don't love animal books. Those that I have read have been through coercion: as part of the curriculum or a student wanted me to read them. 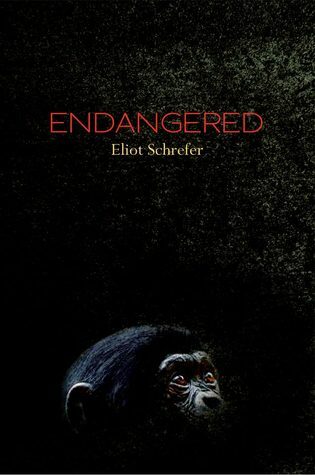 I even dove into Endangered by Eliot Shrefer because he will be the visiting author in my class later this year. Thank goodness I did because this was excellent and made me eat my words. After finishing, I immediately added the next three books in the series to my To Be Read list. No wonder it was a finalist for the National Book Award. For all her life, Sophie's mother has consistently prioritized the bonobo sanctuary she runs in the Congo over her family life, which is why Sophie spends most of the year in Miami with her father. Still, summer is a time for them to connect at the sanctuary, and Sophie's connection grows when she adopts a baby bonobo named Otto. Revolution breaks out in the country and Sophie and Otto are thrust into the jungle, trying to survive and reunite with Sophie's mother. Endangered was intense; I kept wanting to find out what would happen next and rearranged my schedule to have more reading time. There was so much to draw me in: the feeling of foreboding that anything could go wrong in the political conflict, the attachment I felt for the human and primate characters, and the pleasure of learning more about bonobos and the Congo. While I learned a lot, the novel never felt overly didactic or preachy. The story wrapped up nicely (with me bracing myself for tragedy until the last page) and I wondered how there could possibly be three more books in the series. Each book is a separate story about a different primate, so I am eager to read and learn more, as well as pepper Eliot Shrefer with questions when he visits our class.